All of my bananas got very ripe at once. This called for banana baking. Wanting to try something new, I did a Google image search for “banana desserts”. This recipe caught my eye. It was a wheat recipe from Taste of Home’s website that I converted into a gluten free version. The cake is made in two layers using just one banana batter; the bottom layer has chocolate added and the top is plain banana. The cake is nice and moist. You can taste both the banana and chocolate flavors which are delicious together. This recipe is a keeper. 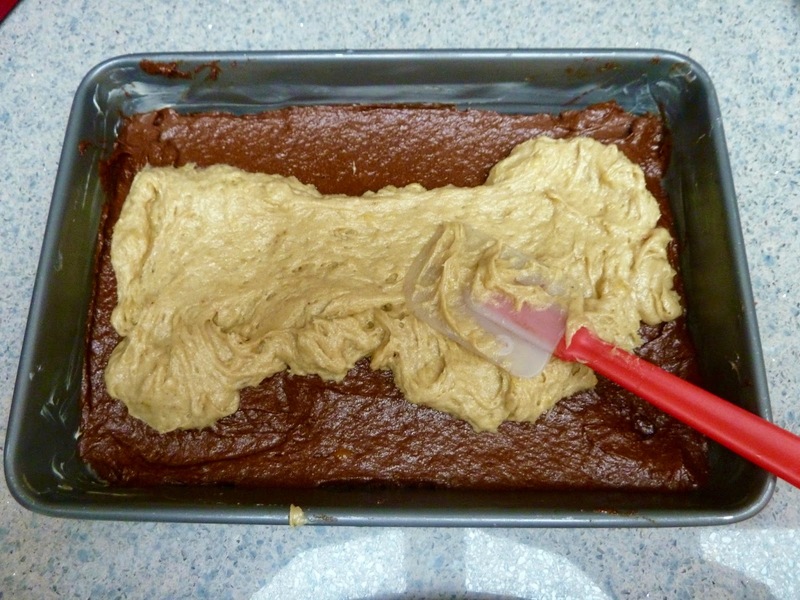 The recipe is easy, but spreading the batter in the pan takes a little patience. I made the dairy free version with oil and applesauce in place of the butter. It was quite good. If you can eat butter, please use it. For me, nothing compares with the taste and richness of butter in any recipe. Makes one 9 X 13 cake. 24 bars. 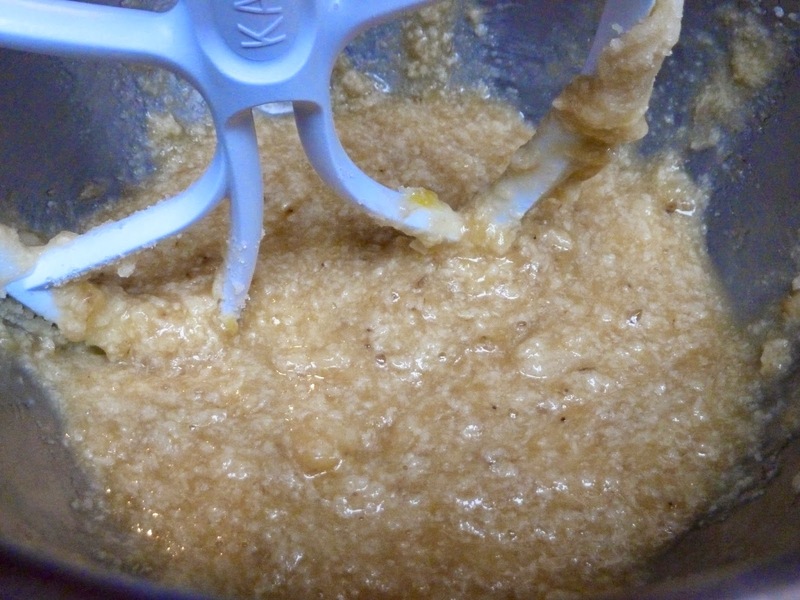 For Dairy Free use 1/2 cup Canola Oil or 1/4 cup of oil & 1/4 cup of applesauce. For Dairy Free use Dairy Free chips. Preheat oven to 350℉. Grease a 9 x 13 pan with butter or margarine. 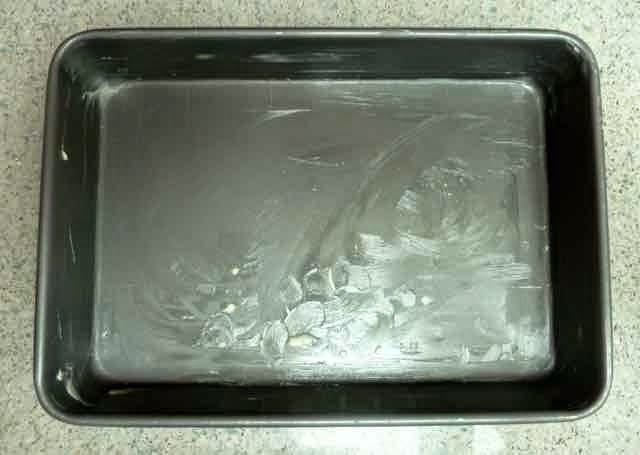 Greased 9 X 13 pan. 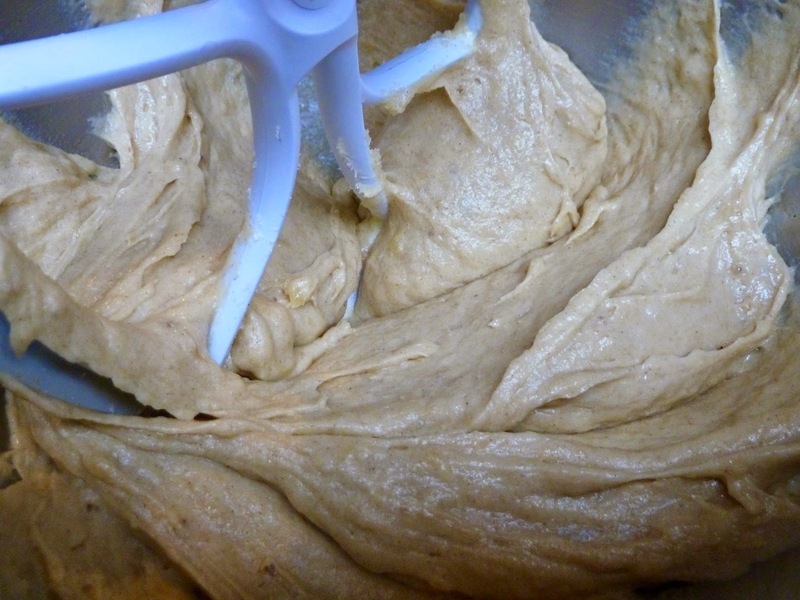 In a medium bowl add the flours, baking soda, baking powder, salt & xanthan gum and mix together well with a whisk. Set aside. 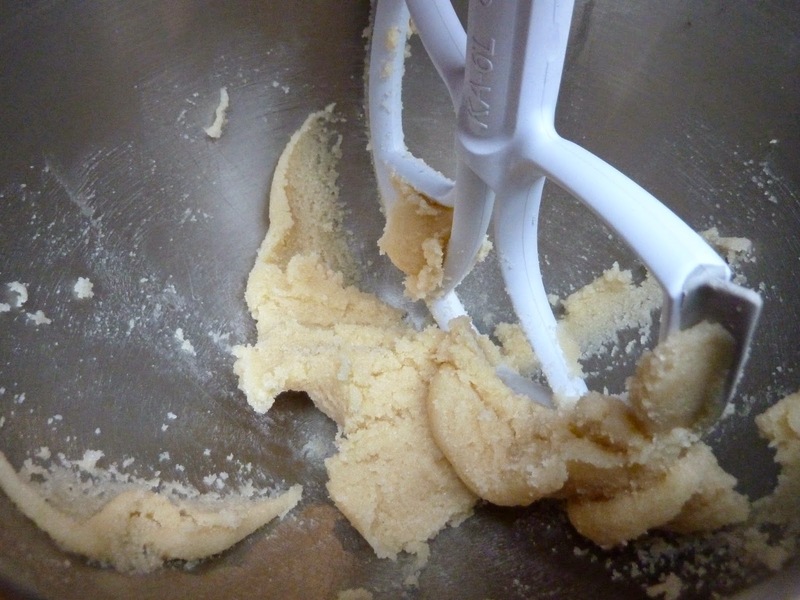 In the bowl of a stand mixer or in a large bowl, cream together the butter and sugar. If using oil and or applesauce instead of butter skip to the next step. Butter and sugar in the bowl of a stand mixer. Add the egg, vanilla and mashed bananas and mix well. If using oil and or applesauce mix in together with the egg, vanilla and bananas. Egg, bananas & vanilla added to the creamed butter. After the eggs and banana are mixed in. All at once, add the flour mixture and mix until well blended. Take about half of the batter and place in a separate bowl. Add the 1/4 cup of cocoa and mix in well. Cocoa added to half of the batter. Spread the chocolate batter evenly over the bottom of the pan. Chocolate batter spread over the bottom of the pan. Spread the other batter over the top of the chocolate batter as evenly as possible. Spreading the rest of the batter over the top of the chocolate batter. Plain banana batter all spread over the chocolate batter. Sprinkle the chocolate chips over the top of the cake. Chocolate chips sprinkled over the top. Bake for 30 minutes or until the cake springs back when pressed lightly with a finger or when a toothpick or cake tester comes out clean. Turn the cake pan half way through the baking time. You may need to place foil over the top for the last half of the baking time if the cake is getting too brown. 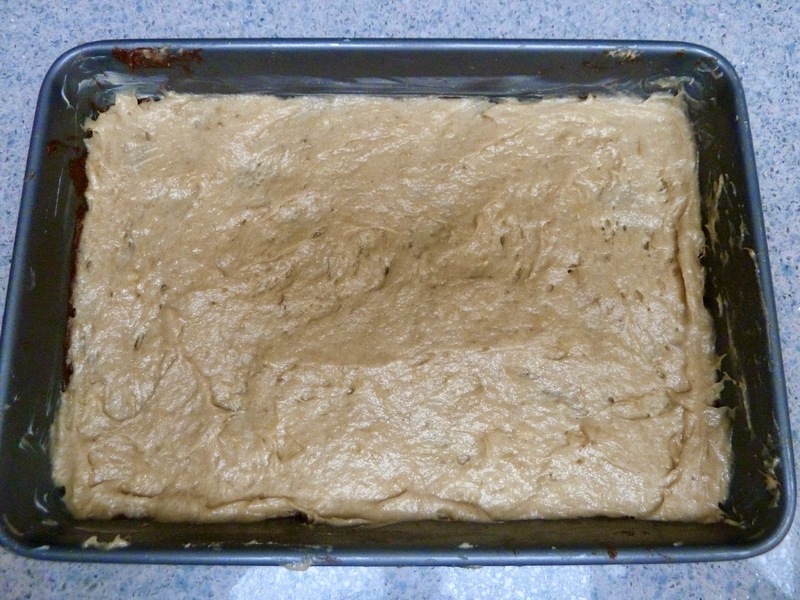 Allow the cake to cool in the pan before cutting into squares. You can freeze leftovers (if there are any). 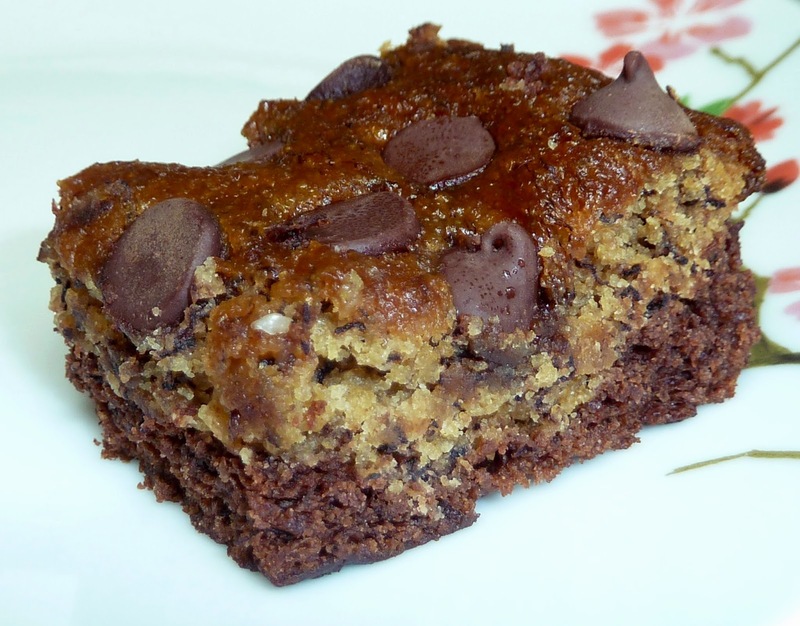 GLUTEN FREE CHOCOLATE BOTTOM BANANA BARS glutenfreebakingbear.com Makes one 9 X 13 cake. 24 bars. 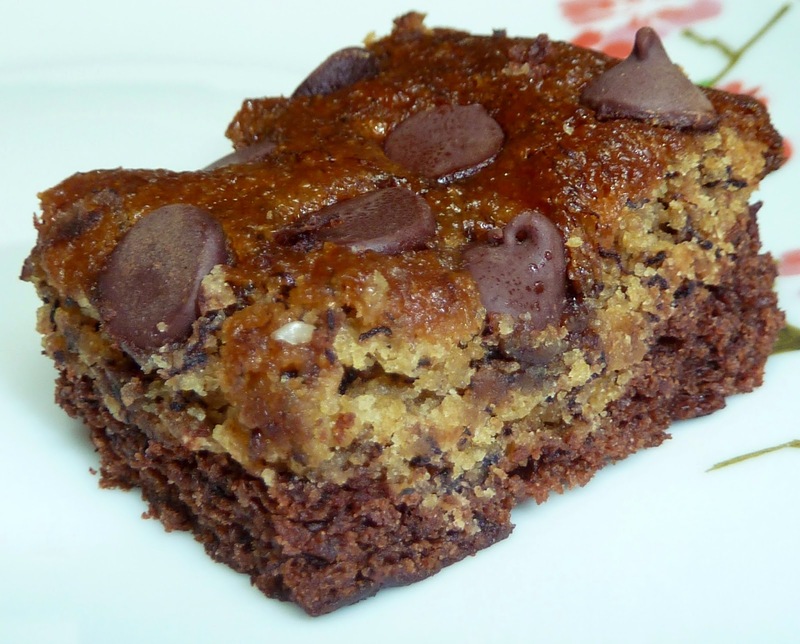 Ingredients 1 cup Sorghum Flour 1/4 cup Tapioca Flour 1/4 cup Chickpea Flour 1 1/2 tsp. Baking Powder 1 1/2 tsp. Baking Soda 1/2 tsp. Sea Salt 3/4 tsp. Xanthan Gum 1/2 cup/1 stick Unsalted Butter For Dairy Free use 1/2 cup Canola Oil or 1/4 cup of oil & 1/4 cup of applesauce. 1/2 cup Sugar (I use evaporated cane juice crystals) 1 large Egg 1 tsp. 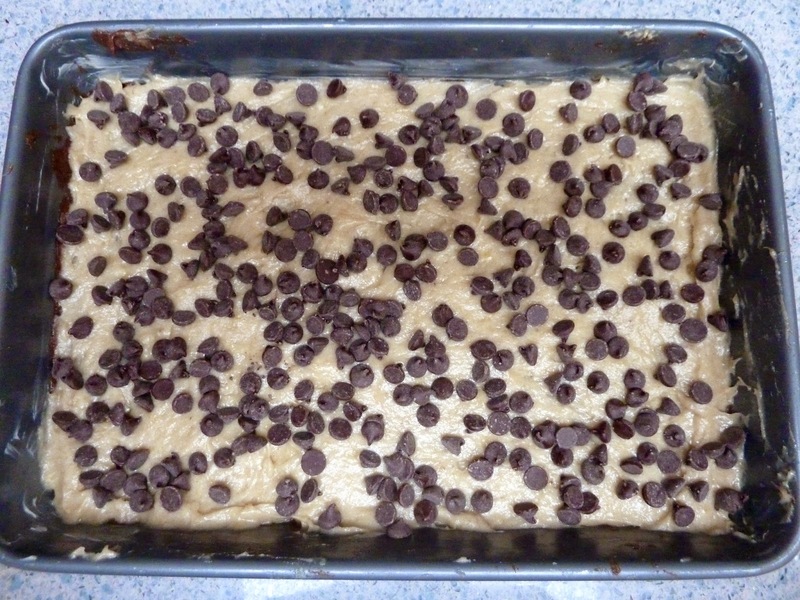 Vanilla 3 medium/1½ cups Bananas - mashed 1/4 cup Cocoa Powder 1 cup Chocolate Chips For Dairy Free use Dairy Free chips. Directions Preheat oven to 350℉. Grease a 9 x 13 pan with butter or margarine. 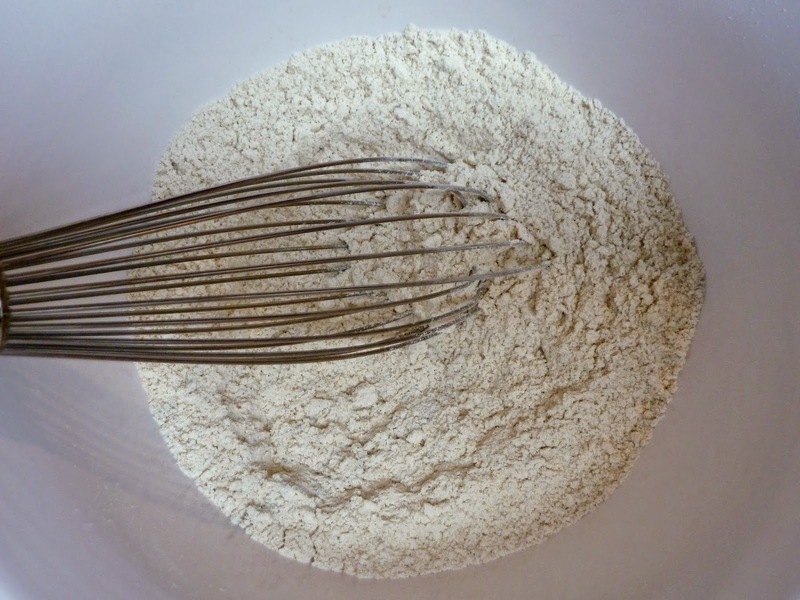 In a medium bowl add the flours, baking soda, baking powder, salt & xanthan gum and mix together well with a whisk. Set aside. 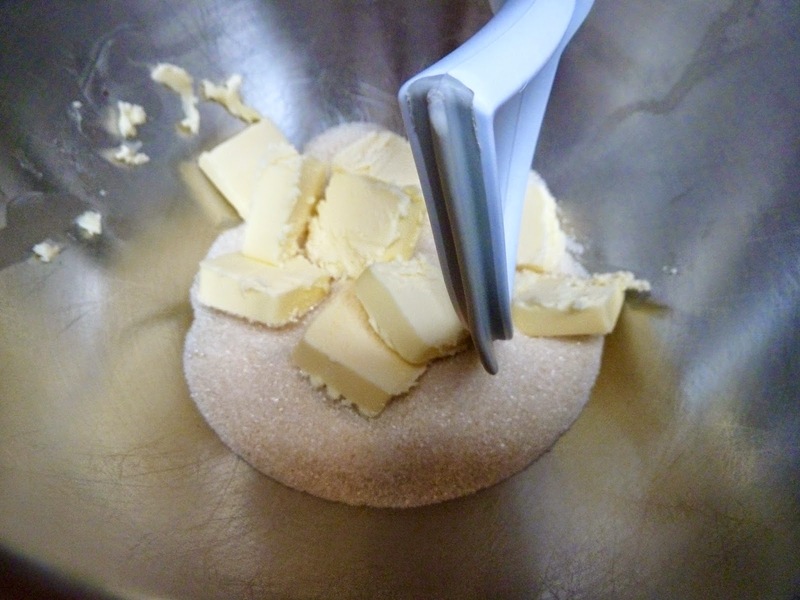 In the bowl of a stand mixer or in a large bowl, cream together the butter and sugar. If using oil and or applesauce instead of butter skip to the next step. 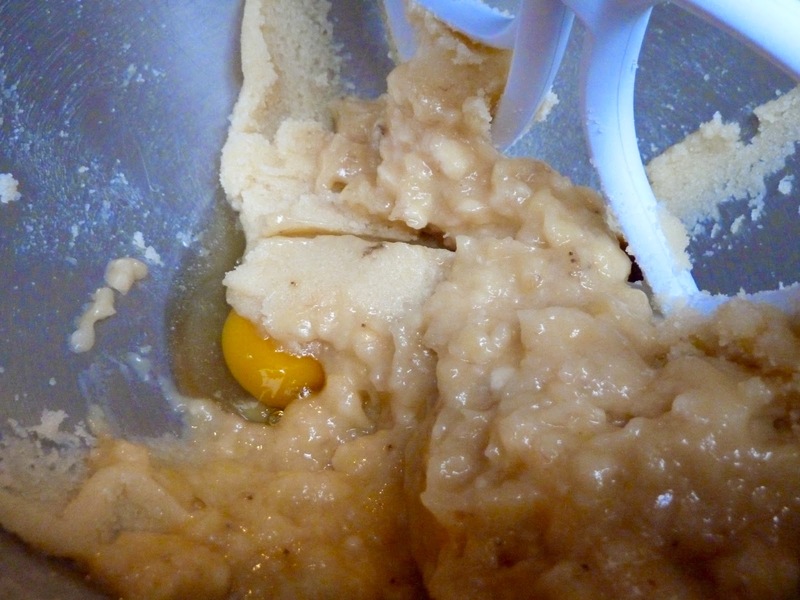 Add the egg, vanilla and mashed bananas and mix well. If using oil and or applesauce mix in together with the egg, vanilla and bananas. All at once, add the flour mixture and mix until well blended. Take about half of the batter and place in a separate bowl. Add the 1/4 cup of cocoa and mix in well. Spread the chocolate batter evenly over the bottom of the pan. 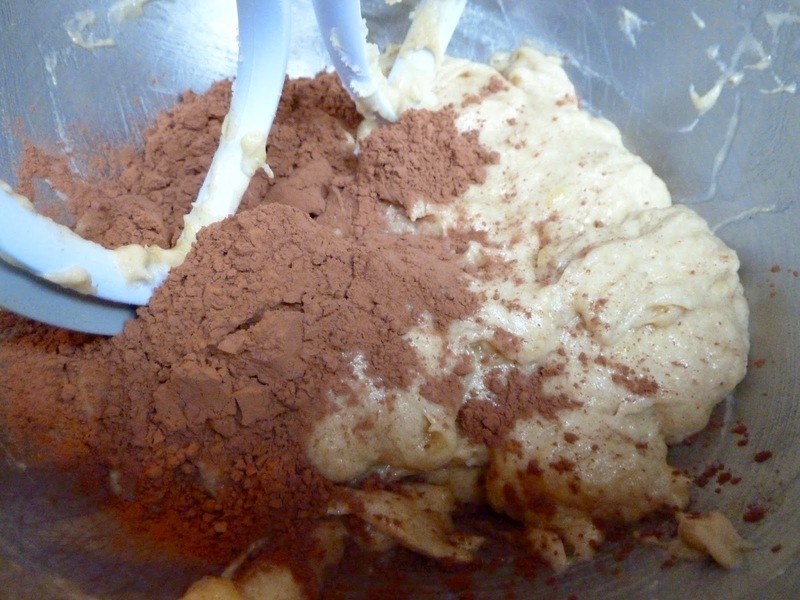 Spread the other batter over the top of the chocolate batter as evenly as possible. 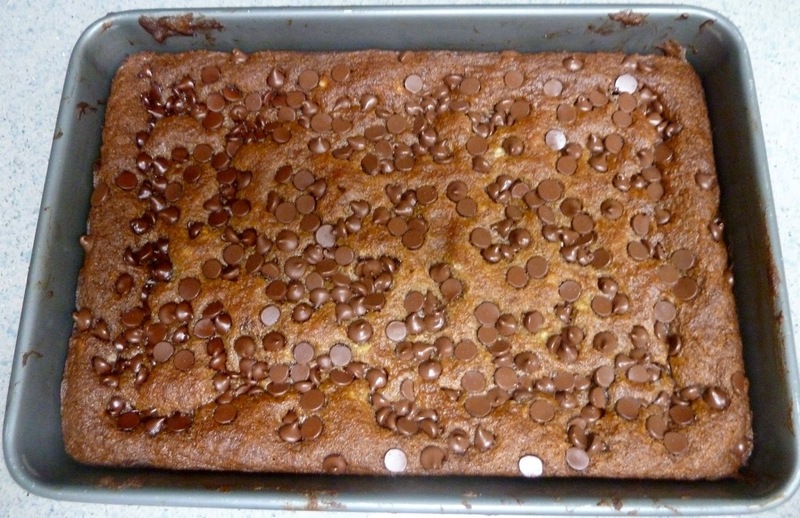 Sprinkle the chocolate chips over the top of the cake. Bake for 30 minutes or until the cake springs back when pressed lightly with a finger or when a toothpick or cake tester comes out clean. Turn the cake pan half way through the baking time. You may need to place foil over the top for the last half of the baking time if the cake is getting too brown. 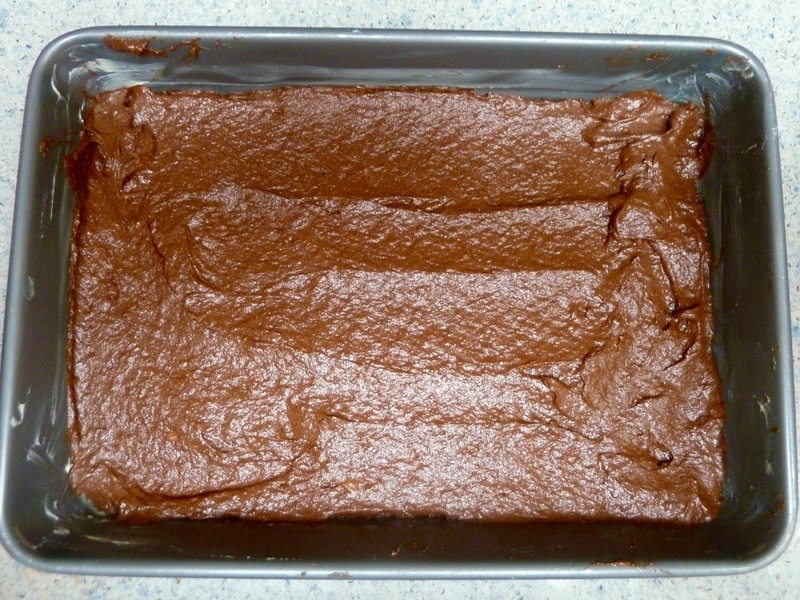 Allow the cake to cool in the pan before cutting into squares. You can freeze leftovers (if there are any).